Vocal Pluses: An unusually high voice for a man, Colfer has an outstanding capability for production of notes in a way that is both light and powerful, giving him a very identifiable voice that can be sweet and lyric, as well as powerful and piercing. The lower register (below D3) is hardly ever used, but is actually quite powerful for his voice type [Give Up the Funk]. Though it sounds as though the larynx may have been lowered slightly to enhance the sound, the technique used to reach his absolute lows is otherwise perfect. The chest register, when unconnected to the head voice, can be powerful and capable, having an extremely punchy, belty sound [Rose's Turn]. Otherwise, when the sound is more often than not mixed with the head voice, the sound can either be light and sweet [Defying Gravity], or can have an extremely focused, edgy sound [Le Jazz Hot]. 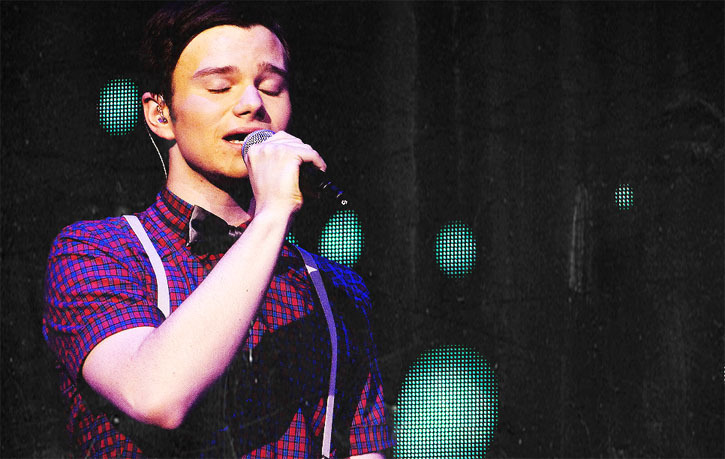 The head voice is the defining feature of Colfer's voice, and the clearest aspect of the individual sound he has. The lower head voice has a covered and cloudy sound that eventually gives way at around D5 to an immensely clear and piercing high head voice, up to Bb5. Overall, all of the registers of his voice overlap consistently, so while the tone may not be identical from bottom to top, it is all produced in a healthy manner, and is extremely well-mixed with a head-dominant sound. The registers are easily connected, and can be demonstrated best in the final vocal slide from F#3 to F#5 in [Le Jazz Hot]. Vocal Negatives:The voice's sound can get a little too piercing at times. Also, sometimes, the mixing is done unevenly, with a head voice that is almost too flute-like to be used viably, belying problems with using a fuller, rounder support. This was more so a problem in earlier seasons of 'Glee', and has all but vanished starting mid-season 2. Talk about found love......Seriously my voice bellow C4 sounds baritonal when I sing at my "lazy weight" but my belting register is just as light as his. But my head voice remains foggy and somewhat falsetto like unlike his even up to Bb5. Either way, I just became his biggest fan. The low range in Give Up The Funk was actually not edited at all, he stated that in an interview once. But he is very talented and it's clear how much he's improved through the series. Erm, a lowered larynx doesn't mean that it was edited, but that he intentionally lowered his voice box to get a richer sound while singing. I dont watch Glee at all, but I am not gonna lie this guy has a very impressive voice and technique. Does he have a whistle range? so in which video did he hit the whistle register?? I'm a countertenor singer classically, and there definitely is a difference between heavier and lighter countertenor voices. Chris has a really light and clear voice, especially in the higher register, while other countertenors like Nicholas Tamagna have a much richer and more dramatic sound. Usually dramatic countertenors will sound like middle-weight mezzos, while lyric countertenors will sound like extremely light mezzos. Ahahahaha!!!! Wow. This goes to show you kiddies having range alone isn't enough. His voice is too squeaky. I can't make it past one minute of his singing. And just a question for the DivaMan; when are you going to make profiles for actual male singers with ACTUAL singing credibility, like Freddie Mercury, Marvin Gay, Stevie Wonder, shoot even Bruno Mars?
. But there are a lot of male vocalists that can be added to that list. Not in the least...Robert Plant. Talk about Spiteful people...anyways he has a very nice classical voice and technique isn't an issue. His voice is a bit overproduced on records but he is perfectly capable of singing very well live. That is a really good question I'm gonna research it, I know this doesn't answer your question but I'll see what I can find out! Okay. Well the only reason i asked was DD put it in his profile as yes so i was just wondering. It doesn't sound like he does so. There are some dramatic counter tenors and the only one I can name is Primohomme on youtube. Nice technique but...I honestly hate the man. Hes sort of a technical dictator and trash talks anyone who has less than perfect technique. As far as his actual singing goes, he hits the note perfectly all the time but his enunciation is terrible. It never sounds right. Sorry, that was my bad. That should have read "no". and I think he's just a very light, youthful tenor voice, I don't hear anything feminine about it and I would never say that he has a high tessitura, even though he sings a lot of high notes. But that's just how I feel about it. I absolutely love his voice. I love everything he can do with it, and sometimes it doesn't sound quite right, but when it does he's superb. My parents would make all sorts of jokes about him simply from hearing him talk, but I told my mother to sit down and just listen to him, she admitted he was quite something. In my opinion, I would give a thumbs-up for the site's negative comment about Colfer's voice. You're right, his voice can be piercing at times and is also pitchy (well, I guess it's typical for countertenors like me) just like when he had to sing Whitney's I Have Nothing, it just didn't fit him. I must say I love his voice, so unusual, he remind me a lot of Chris Kiripatrick of Nsync. Primohomme is more spinto than dramatic. But I agree. His singing is so hard to listen to because he enunciates the words awfully. His tone never sounds natural. He's so keen on technique that there isn't any musical quality in his singing anymore. By definition, a countertenor is a male whose central tessitura and placement is in the contralto, mezzo-soprano, or soprano range. They come in a variety of flavors and timbres. So Chris Colfer can never be an actual contralto since these are by definition female vocalists. Hence he is a "countertenor" and not a "contralto." As a rule, counters tend to have light voices but there are weighty dramatic variants, too. Colfer is of the lighter group, however. Hence it is possible for dark, heavy female voice to be heard as thicker and weightier than the voice of a countertenor. However, it is important to remember that each voice and voice type can have a different color throughout the range. The bottom notes for a countertenor tend to sound very mannish, thicker but still relatively lightweight and they tend to lighten up quickly as they move up the scale. Contraltos tend to have a thick sound until they begin to mix with their head voice. Most of the counters I know sing usually between D3 to G5 for their central tessitura, but some select ones sing up into the sixth octave and can hit whistle notes. As a group, they are definitely a rare breed -- especially since many of their full head notes have a rounded quality different from pure falsetto singing. Chris sounds almost exactly like a soprano. However he couldn't be classified as one since he is male. I think the Alto classification is more accurate than the "lyric countertenor" since his voice is so high. Thoughts? A male who sings in the vocal tessitura of a soprano is called SOPRANISTA. Whoah we agree on something right of the bat! Let's explore. I think this is still one of the greatest male singers. What say you? LOL so much agreement. I am scared to continue exploring and ruin this perfect moment. I'm sorry I'm probably going to get hated on so much for this but I just have to say it. Chris Colfer's voice makes me absolutely cringe. I say this as a proud gay man myself: I am all for effeminate men and find Drag Queens to be an absolute blast but the sound of a man singing like a woman just makes my blood curdle. Grow testicles, brother, you're supposed to be a dude. Also, I've seen Glee a handful of times and it just kills me that all these Gleeks (which is apparently a euphamism for simpleton) go on and on about their "eargasms" at watching him perform. He has ZERO stage presence and in fact his facial expressions and vocal delivery make him all but unwatchable at best and laughably horrific at worst. Alright, there, it's all out now. Let the Gleeks commence the hating. "Grow testicles, brother". Wow... He can't change the voice he has, except pulling an Xtina and that's not something wanted. Say you're just not a fan of his voice but he doesn't have to change it at all. And I'm in no way a Gleek, I dislike the show, and I'm not a fan of him either. That's just common sense. well of course he can't change it that goes without saying but the fact that it is so high makes it incredibly difficult to listen to. I never said he *had* to change it I just said to grow testicles as a way of making it clear that I'm not personally a fan of guys who sing with that kind of piercing quality. It's not so much that he sounds like a woman it's more that he sounds like a man *trying* to sound like a woman and that just makes me shudder. I realize that he can't change his voice physically but that doesn't mean I have to be accepting of the idea that that's what his voice sounds like. I just don't like it. what you are implying is that he sings like a woman (range and tone/timbre) by choice like many effeminate gay guys do either on purpose or not, yes his voice is piercing and honestly i cant always listen to him myself. but i dont insult him or say disrespectful things about him. he cant change the sound of his voice (unless he took operatic vocal lessons where they teach you to darken your sound) im not saying you have to accept it but dont insult it. we dont need more gay men bashing eachother over our differences. we get enough of it from everyone else. "I am all for effeminate men and find Drag Queens to be an absolute blast but the sound of a man singing like a woman just makes my blood curdle. Grow testicles, brother, you're supposed to be a dude." is the most contradictory statement I've ever heard.